1 » The Orlando Sentinel‘s Andrea Adelson sat down with CBS college basketball analyst Seth Davis to pick his brain about the state of the Florida Gators. 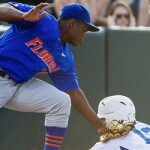 Saying the Gators are still “in pretty strong position for the tournament,” Davis dares the selection committee to “find me 34 at-large teams that are better.” He goes on to say that “the win over Tennessee helped [Florida] more than the loss to Georgia hurt them,” but indicates the team could probably make it in to the 2010 NCAA Tournament with a single win in the 2010 SEC Tournament. Bubble Watch » Though the Gators dropped a heartbreaker to the No. 13 Vanderbilt Commodores Tuesday, their compadres on the bubble are seemingly doing their best to help keep Florida’s hopes alive. Auburn (15-15) took down Mississippi State (21-9) 89-80 Wednesday, Notre Dame (20-10) upped their stock but dropped UConn’s (17-13) with a 58-50 win and Florida State (21-8) did the same with a 51-47 victory over Wake Forest (18-9). On Tuesday, Ohio State (24-7) defeated Illinois (18-12) 73-57, Villanova (24-5) kept Cincinnati (16-13) down 77-73, UTEP (23-5) stung Marshall (22-8) 80-76, Michigan (14-15) dashed Minnesota’s (17-12) hopes 83-55, Marquette (20-9) routed Louisville (19-11) 69-48 and Clemson (21-8) took one from Georgia Tech (19-10) 91-80. 2 » Gators women’s basketball (14-15, 7-9 SEC) will open the 2010 SEC Women’s Tournament as a No. 7 seed taking on the No. 10-seed Auburn Tigers (14-15, 5-11 SEC) on Thursday at The Arena at Gwinnett Center in Duluth, GA. The game, which will begin at or around 2:30 p.m., is a first-round contest whose winner will meet the No. 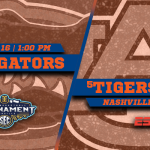 2 Kentucky Wildcats in the quarterfinals on Friday at 2:30 p.m. Florida is 15-29 all-time in the SEC Tournament and has not made the championship game since 1997.